Dubai: Dubai Metro’s Green Line is likely to pass via Meydan in Nad Al Shiba on its way to Academic City, as part of a proposed extension of the rail network, Gulf News has learnt. The extension was announced last year, but the route hasn’t been finalised yet, with studies being carried out currently on possible connectivity to the Meydan Station of Etihad Rail near Meydan. The union rail network, which is set to complete phase one by 2017, is also expected to connect with the Red Line of Dubai Metro at Al Maktoum International Airport, a senior Roads and Transport Authority (RTA) official announced at the fourth UITP Mena Congress, being held at the Dubai World Trade Centre. The four day event that began on Sunday has seen experts from across the region gather and exchange knowledge and expertise on the development of public transport in the Mena region. “Dubai’s strategic master plan for infrastructure development is being revised with an aim to prepare of the Expo 2020 as well as to connect with the larger national network,” said Abdul Mohsin Younes, CEO of RTA’s Strategy and Corporate Governance Sector. The authority has launched survey to identify the areas of improvement and the projects that will be required to serve the mega event, which is expected to bring in millions of people to Dubai. “A major focus of the study, which will be out next year, is to further develop the transport sector which will get a boost with the launch of Dubai Tram in November. The study is mainly focusing on providing rapid connectivity within the city as well as with other emirates and that could be done by connecting Dubai Metro with Etihad Rail network,” added Younes. He said RTA is currently studying feasibility of linking the two networks at two locations — Meydan and Al Maktoum International Airport. “We are looking at various options and one of it could be extending the Green Line to Meydan on its way to Academic City, but nothing is certain, there could be other ways of connectivity as well. As for the Red Line it will be extended to Al Maktoum International Airport, facilitating mobility to the Expo 2020 site,” said Younes. Talking about one of the ways of generating revenues for the project, Younes said RTA is putting up several stations for naming rights. The concept has so far generated Dh2 billion by selling the naming rights of 13 metro stations and as many as 10 more stations could be up for grabs soon. The project is expected to cover almost all the operation and maintenance cost of Dubai Metro. 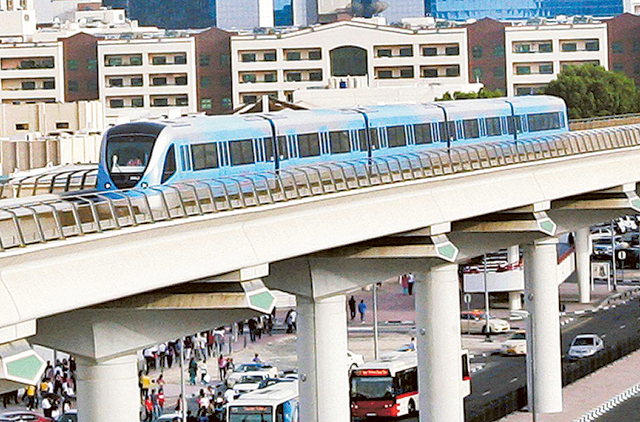 Speaking about the proposed connectivity, Eisa Al Dossari, former CEO of RTA’s Public Transport Agency and independent transport consultant said that the proposal of connecting Dubai Metro with Etihad Rail doesn’t seem feasible. “I know it is being studied, but it doesn’t seem feasible. I guess the connectivity is more likely be through bus routes. The route of the Etihad Rail is far away from the city, which will make it difficult for people to make quick commute between emirates. Etihad Rail is more suited for long distance travel,” said Al Dossari, who is head of Eisa Transport Consultancy. He suggested that the authorities should suggest a separate high-speed national commuter line that could link Abu Dhabi, Dubai and Sharjah and travel time between the emirates could be reduced to half an hour. The UITP Mena Congress and Exhibition is the biannual gathering of public transport experts from the region. Being organised by Roads and Transport Authority (RTA), the fourth UITP Mena Congress and Exhibition 2014 is the largest public transport gathering where industry leaders, policy makers, legislators, developers, consultants, operators, and manufacturers will come together to discuss the future of public transport solutions for the region.